Sidney Lowe has been feeling the pressure. It is, unfortunately, the very same pressure that built to the point that it sent Lowe’s predecessor, Herb Sendek, to the desert clime of Arizona State, even after several years of making the NCAA Tournament. It’s the pressure of two major basketball powerhouses within minutes of NC State’s campus in Raleigh. Duke and North Carolina aren’t just tough competition. Considering that the school own the last two national championships, and three of the last six, the two behemoths of basketball are beating the entire nation, not just the ACC. Add in the pounding that the rest of the Atlantic Coast Conference can lay on any team and it’s a hard fight to win. Sidney Lowe took over the team and pledged to make it competitive, but a quick slide back into obscurity has made the Wolfpack faithful edgy. Last season’s team finally showed some spark at the end of the season, but still lacked the deep reserves of talent that will be needed if they want to climb back out of the ACC cellar. The recruiting class that Lowe has coming in this season can get it done. Much like Paul Hewitt last season, Lowe has the horses to compete, even though they will be young. Now, he just has to prove he can coach a talented stable of young players, because one or more of them might bolt early. Three five star players are coming in, and all of them might have futures beyond college. C.J. Leslie is coming in off a high school All-American season, Ryan Harrow, the speedy point guard, will be able to see time on the court quickly and Lorenzo Brown will finally add his combo guard skills after taking a year long detour. Added with NC State’s returning roster, it’s time for Lowe to prove himself by returning back the NCAA tournament. Anything less, and the pressure from Chapel Hill and Durham will probably force him out the door. The Chris Paul Elite Guard Camp is exactly what it sounds like: a high intensity skills camp designed to work specifically on the skills needed to be an elite point guard, not just at the college level but beyond. This event is a no-nonsense camp not intended to showcase players, but to work strictly on their game. Chris Paul immerses himself and the attendees in all-out workouts, and the pace is fast, with only a couple of minutes per drill before switching to a new drill. The court is divided into college and high school players, and on the college side is a bevy of known stars and up and coming players. Kyle Singler, Nolan Smith and Seth Curry from Duke, along with incoming UNC freshman Kendall Marshall and Harrison Barnes. Wake guard and local star CJ Harris is also in attendance, as well as Durand Scott (Miami), Brandon Triche (Syracuse), “Scoop” Jardine (Syracuse), and Kemba Walker (UConn). I’ll go more into the college players in a future post. It’s important to note the presence of Kyle Singler and Harrison Barnes, forwards working their butts off in a point guard camp. Harrison Barnes high release is nearly indefensible by a guard, with Barnes’ 6’8″ size and high release getting off shots easily. The first night features a single workout session and my focus was primarily on the high school players, and I’ll be posting more about several key recruits in attendance including Rodney Purvis (PG, 6’3″, 2013), Marquis Rankin (PG/SG, 6’0″, 2011) and Bishop Daniels (PG, 6’2″, 2011) as well as many more which I’ll cover in more detail. Rankin has committed to Virginia Tech. The camp is intensely instructive, with coaches giving constant instruction to players on position, footwork and most notably defense. Although scouting players isn’t as accurate after these workouts as their legs tire, there was still much to glean from the first night. One highlight of the camp was watching Harrison Barnes working out in drills with Chris Paul, and one on one with Chris Paul taking part, going against Kendall Marshall and several other players. Quinn Cook (PG, 6’1″, 2011) was unable to participate in the first night of workouts because he tweaked his ankle the previous night in a summer league game. He said he felt confident he could participate the next day and was icing his ankle. 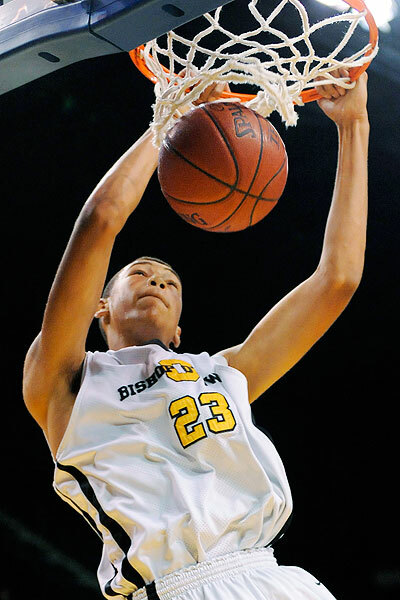 Brandon Ashley isn’t your typical sophomore in high school. Standing at 6-foot-8, this young, athletic man is developing his game for the next level. At Bishop O’Dowd in California, Ashley is striving at a very young age. While playing with both Bishop O’Dowd, as well as his AAU team the Oakland Soldiers, Brandon is bound for a big summer. 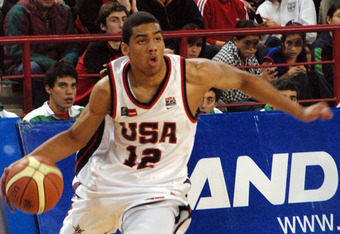 Slam.com ranks him as the seventh best prospect in the class of 2012. This summer he will attend events at the Nike Hoop Jamboree in St. Louis, Peach Jam and Las Vegas. Along with that, Ashley is on the US National team and will attend tryouts very soon. While his game is still developing, Ashley competes with the ranks of big men in his class like Jamesville-Dewitt’s DaJuan Coleman and Andre Drummond of St. Thomas Moore. While Ashley has not received as much hype as he deserves he will get there soon. His game is progressing along the way. “My game is developing right now,” said the 6’8 Power Forward. “I have a pretty good inside game and am currently working on my outside game. I have a solid jumper and my handle is progressing.” It may be progressing but colleges are already taking note. That being said, Ashley is drawing plenty of interest from different schools. West Coast schools have primarily noticed his abilities so far. “California, Washington, Arizona, UCLA and Stanford have offered me,” said the California native. “There are no early favorites right now. I am still open to all schools.” Ashley is taking the recruiting process slow and is in no hurry whatsoever. “I haven’t really visited any schools yet. I have been in Stanford and Cal’s gyms but that is about it so far.” Look for more offers to roll in this summer for Brandon. On a final interesting note, North Carolina recently got in contact with Brandon and expressed some interest in him. “UNC will always be a great school but at the moment they aren’t any higher on my list than any other school,” stated Ashley. From the looks of it, Brandon will take his recruitment slowly. He has a long way to go in developing his game to the next level but he is bound for greatness sometime soon. Check him out on the west coast sometime and for people on the east coast he will be at the Peach Jam ready to do work! When Jabari Brown decided to leave national powerhouse Findlay Prep in January of 2010, critics believed it was the wrong decision. Brown, not only rose to the occasion, but jumped in the rankings and took his game to another level. While the 6-foot-3 shooting guard (Class of 2011) returned to his hometown of Oakland, California, he would enroll at Oakland High School. The junior averaged over 23 points per contest as he helped lead his squad to a winning record. Through that and his jump in the world of AAU helped lift his recruiting to new levels. Brown, who plays with the Oakland Soldiers, is part of one of the most talented teams in the country. The Soliders consist of players like Findlay Prep’s Nick Johnson and Jesuit’s Kyle Wiltjer, both top 50 players in the class of 2011. While playing in the top tournaments around the country this summer, Brown is attracting coaches’ eyes towards him. The California golden boy currently has offers from Georgia Tech, Washington, Arizona State, California, Maryland, UNLV, Wake Forest and Next Mexico. Two ACC schools, Wake Forest and Georgia Tech, were the most recent to offer Jabari. Another ACC squad, Maryland, has also become involved. While the distance on paper from California to the East Coast doesn’t seem like one most players are willing to take, “distance is not a factor” for the sharp-shooter. Maryland appeals to Jabari due to their, “tradition, conference and Head Coach Gary Williams is a great coach.” He likes Georgia Tech because, “they have had so many good guards, their conference, and Head Coach Paul Hewitt.” Wake Forest is also a school he enjoys because of, “the feel that I have gotten from the new coaching staff, along with their style of play.” Despite the departure of Head Coach Dino Gaudio from Wake Forest, his replacement, Jeff Bzdelik of Colorado, has done an excellent job. “I think Coach Bzdelik is a good coach who would put me in the position to flourish from style of play,” said Brown. As of now, Brown has no favorites and is nowhere close to making a decision on where he will commit. If you break down Jabari Brown’s game, it is simple, yet deadly. Jabari puts it best when he says, “I’m a guard that can score from anywhere on the court, as well as get my teammates involved.” He also said, “I’m a leader who hates losing.” He is simply deadly. So far, Brown’s spring season of AAU with the Soldiers has gone well. They have been one of the top ranked teams in the country. Scout.com’s Evan Daniels even called them the best AAU team of the spring. Brown will take his talent to Chris Paul camp, Paul Pierce’s Skills Academy and LeBron’s Skills Academy. Watch out for Jabari Brown this summer as he looks to explode onto the AAU scene even more. He has already been ranked as one of the top 15 players in the country by Scout.com and looks to go higher on the list. Just like his shot, this kid is nothing but net. This article originally appeared on BasketballElite.com. Is UNC Pulling A Fast One With James McAdoo? It’s no secret that any college basketball team needs big men, and it’s also no secret that the UNC Tar Heels need big men in the worst way after the sudden transfer of the Wear twins. After looking at Kadeem Jack, a 6’9″ player who ultimately decided to attend prep school for a year, the Tar Heels landed senior transfer Justin Knox. Now, it seems that one of their highly regarded 2011 recruits, James McAdoo, may be able to reclassify and attend UNC a year earlier than he planned. What he would need to do is take three classes over the summer and he’d be able to join the UNC squad in the Fall, helping them out in the post sooner. All of this has a lot of non-UNC fans crying ‘foul’, saying that UNC is playing fast and loose with the rules in order to help their powerhouse basketball team. However, the truth is that players reclassify all of the time, and it’s actually no different than what hundreds of players do every year by playing a year after high school in prep school. It’s just that instead of extending their high school career by a year, McAdoo would be shortening it. Duke player Andre Dawkins did this just last season after the sudden transfer of Eliot Williams. What McAdoo would be giving up would be the year of accolades for being a high school All-American, meaning he wouldn’t be able to play in the McDonald’s All American game or the Jordan Brand Classic. However, if McAdoo is physically ready to play in college, it will get him closer to his goal of playing in the NBA faster, and that’s no small thing. So after he participates in the USA Basketball U17 championships, he will have a decision to make, and the Tar Heel nation will wait. You are currently browsing the ACC Basketball Recruiting blog archives for June, 2010.